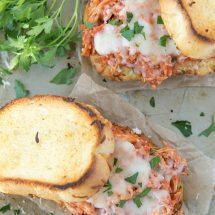 This Shredded Chicken Parmesan Sandwich has tender, flavorful shredded chicken coated in a quick, homemade tomato sauce sandwiched between two crisp slices of cheesy Texas Toast. 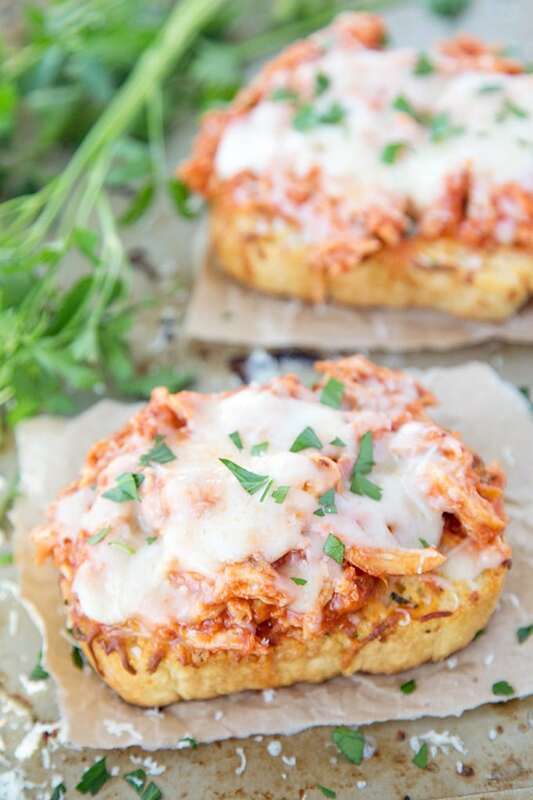 If you’re looking for an easy weeknight dinner recipe, this is it! Quick dinner recipes are a must for any mom to have in their back pocket. 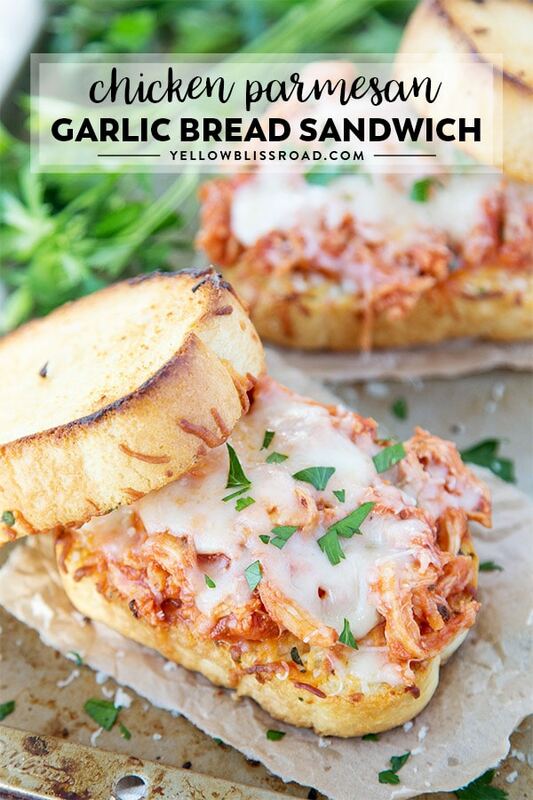 I often turn to Easy Baked French Dip Sandwiches or Ten Minute Oven Baked Tostadas and these Shredded Chicken Sandwiches have made them way up in rank on my weekly menus. The week before I had cooked up a bunch of my favorite Slow Cooker Shredded Chicken, so I pulled some of that out of the freezer. I noticed a half of a package of frozen Cheesy Texas Toast and it gave me an idea. 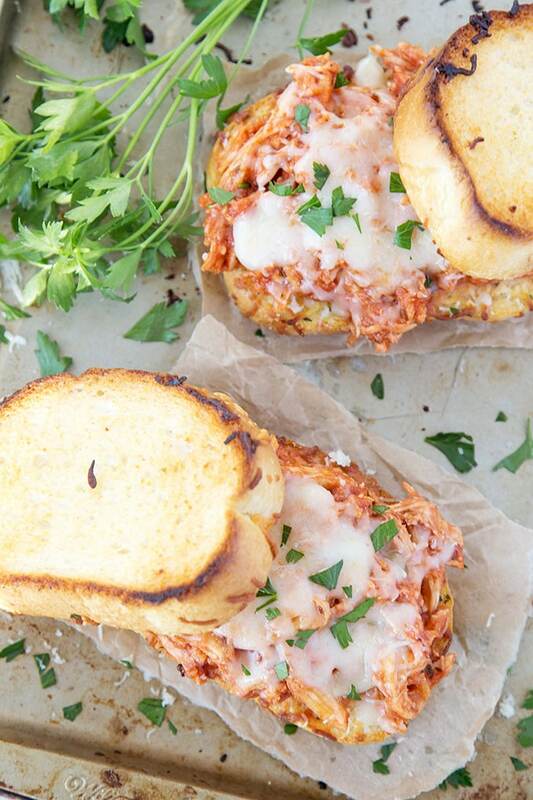 These Shredded Chicken Parmesan Sandwiches were the awesome result. You could also make chicken in the Instant Pot or simply boil it. 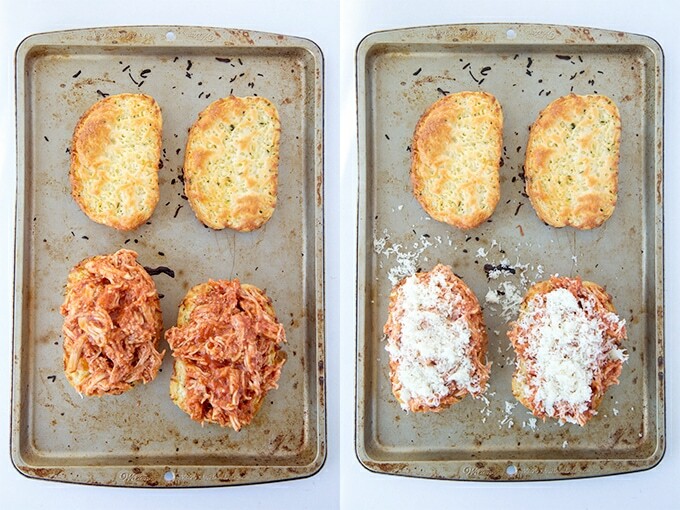 Preheat the oven and bake some Cheesy Texas Toast (or other thick, sliced, garlic bread) according to package directions. We use Marzetti brand and usually by the cheesy variety that they have at our grocery store. I cooked a quick homemade tomato sauce with a little basil and oregano and simmered it for a few minutes before adding the shredded chicken. Heat a teaspoon of olive oil in a small saucepan and cook some minced garlic for 30 seconds or so, until it is fragrant. Add a can of tomato sauce and some basil, oregano and onion powder to the pan and bring the mixture to a boil. Simmer the sauce on low for several minutes, then stir in some shredded chicken and cook long enough just to heat the chicken. When it was heated through I added some fresh Parmesan and Mozzarella Cheeses. By that time the cheesy toast was nice and hot and crispy, so I just scooped out the chicken onto the toast, sprinkled some more cheese on top and melted it under the broiler. A little fresh parsley was the finishing touch. Basil would also add a nice flavor. This recipe will make enough for 2 sandwiches. If you’re feeding a family of 4 or more, you will want to increase the amounts accordingly. If you’re a fan of sliders, this recipe would translate perfectly to slider form. Use pre-baked garlic rolls, or just dinner rolls and spread a garlic butter mixture on top. I made the quick tomato sauce myself for two reasons. It was just my daughter and I so I only needed two sandwiches, and I didn’t have any other sauce on hand. If you are making a large batch of sandwiches, you could use a 24-ounce jar of spaghetti sauce of marinara. If using that size jar, I recommend tripling the other recipe ingredients to make 6 sandwiches. This was such an awesome recipe! I didn’t have Texas Toast or bread but did have a package of rolls. So we turned these into sliders instead. The whole family inhaled them. I did just grab a great deal on loaves of Texas Toast style bread, perfect for dinner for 6. Thank you! Thank you Tiffany! So happy that you and your family loved this recipe! Do you just boil the chicken and then shared it ?? You can do that, or use one of the methods linked in the post to make shredded chicken in the slow cooker or in the instant pot. I didn’t follow your recipe but I did use your idea. I had some leftover spaghetti sauce, grinder rolls, frozen chicken breast and cheese. It came together so fast and tasted so good, I was upset I didn’t think of this myself. No frying or fussing. Great recipe and great idea. Thanks for sharing it. I made it with flatbread, rather than the toast. My husband and I LOVED your recipe. It was fairly quick to make and VERY easy. Could you make this in the crock pot with sauce already in it? Sure, you could heat up the chicken with the sauce in the crockpot. This was one of the best sandwiches ever!!! 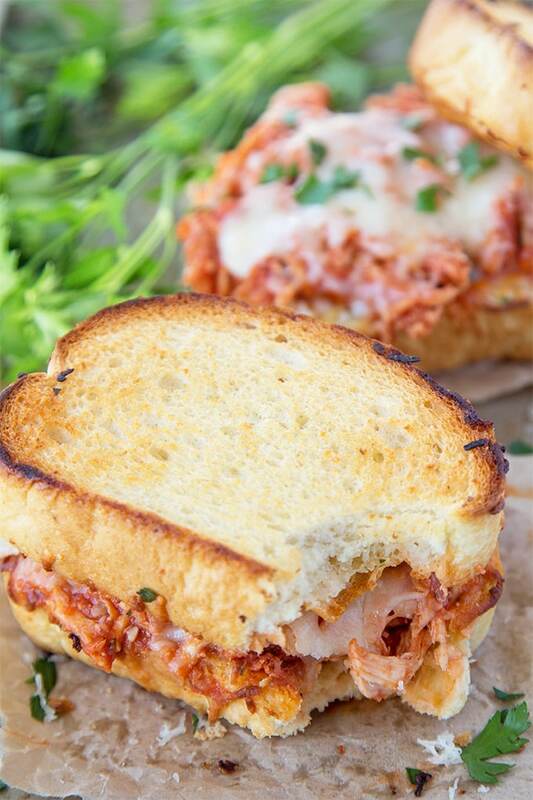 We used rotisserie chicken and fresh sourdough bread grilled with Parmesan cheese on the outside. It was delish! Thank you for the recipe. It’s a keeper! What sides would you serve with this luscious sandwich? I love it with a crisp green salad! Did you use chicken thighs or chicken breast ? Can you use barbeque sauce instead of tomato sauce ??? Sure! I think that would be delicious! So easy to cook and delicious. I cook this sandwiches for my girl at breakfast and she was so surprised. Thank you for sharing this recipe with us. This sandwich was seriously so delicious and easy to make! What side would you suggest for a quick dinner? We enjoy a nice crisp salad or veggie sticks with these sandwiches. We made this today with colby jack instead of mozzarella (because we were out of it), and it was so delicious. So glad you enjoyede it! Do you mind sharing your recipe for your homemade sauce? 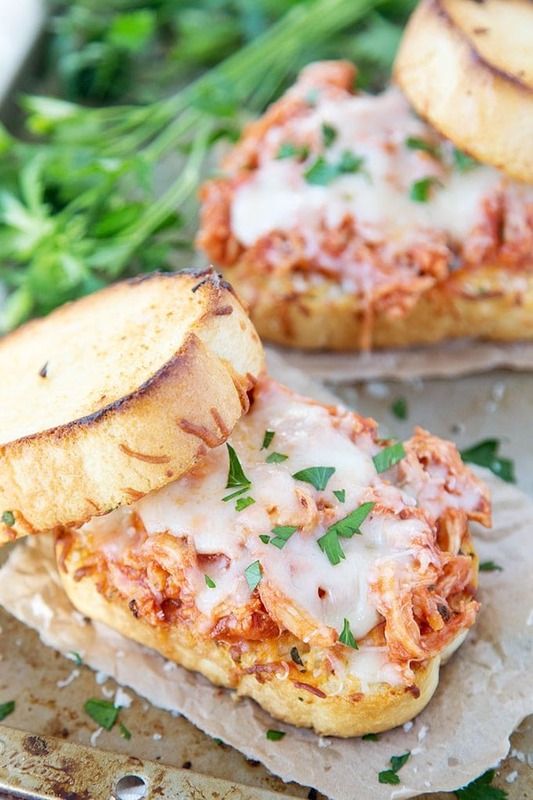 I love the simplicity of the shredded chicken sandwich. Would you tell me how you prepare your chicken in the slow cookers? I would love to have a supply in the freezer to pull from for quick meals.